Caribbea Lifestyle Media gave you the buzz on the new album coming and kept you updated when Serani made the billboards. 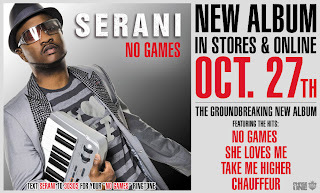 As anticipation builds for the October 27 release of Serani's US debut album, titled "No Games" after his crossover hit of the same name, the tracklist has now been released. The 14 track set contains many completely new songs along with with new versions of Mama Still Hungry, When its Cold and Romance Me, alongside the title track and current hit "She Loves Me" rounding out the impressive album. "We put a great emphasis on the quality of the production and sound on the album," said Serani. "As a musician and producer myself I'm very pleased with the sonic quality of the album and I am sure my fans will be just as pleased. You always hear people complaining that Jamaican artists release albums that are basically compilations of songs that are already out there so we wanted to do a lot of new material. Even the tracks that are known have been re-worked and upgraded! Most of the album is for my ladies, but there is something on there for everyone." "No Games" will be available in stores and online Tuesday October 27. The NY release party will be held the same night @ SOBs Club in Manhattan NY.